This book was a review book received from LibraryThing and McBooks Press. I have no idea why I requested this book, other than that I have a slight obsession with cookbooks. I own probably two and a half shelves full of them, but I cook from them very rarely. I'm hoping to get back to cooking from them now that we have a little more money coming in, so hopefully, I'll get to try some of the recipes in The Jewish Princess Cookbook soon. 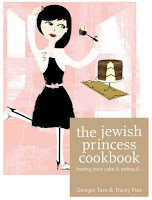 Now, I should preface this review by saying that I am not Jewish, and I certainly do not consider myself a princess, so it feels a little disingenuous that I should be reviewing this particular cookbook. The women who wrote it ARE Jewish and, apparently, are also princesses. I'm not really sure what makes a Jewish princess, other than, it appears, a certain traditional take on homemaking (the woman does it), and a yen for designer goods (cited in this cookbook are Gucci, Prada, Dior, D&G...and this is not an exclusive list). The authors state, however, that "every woman has a little bit of a JP [Jewish Princess] in her - or if she doesn't, she certainly should" (pg. 13). Although the text in the book seems a little fluffy for my taste, the food sounds DELICIOUS. Since I am not Jewish, I do not keep kosher, but this book would be great for those folks who do and need new ideas for the Sabbath dinner, for entertaining, or for every day. My good friend from law school is a non-Jew marrying into a Jewish family, so it might be good for someone in her situation, too, who is just learning kosher laws and wants to impress the in-laws with a dietarily-proper Jewish meal. The book is divided into eight sections: Appetizers, Salads, Soups, Meat, Fish, Desserts, Cakes, and the Ultimate Dinner. Some of the appetizers are things that I would love to try, like Pink Grapefruit with Brown Sugar, Watermelon and Feta Cheese, and Sesame Chicken Balls. I'd also love to make the Ultimate Dinner's Chicken Soup, as well as many of the desserts (Chocolate Refrigerator Cake?!). While the constant references in the text to Jewish Princesses, shoes, handbags, and getting one's hair done grated on my nerves after a bit, someone a little more girly than I might appreciate it more. The book is what I might call a "chick lit cookbook." But the recipes sound great. Overall, I'd give the book three out of five Whatevers. I hope I get a chance to use some of these recipes soon! Well, I've finally reached the end, and what a sweet ride it's been! 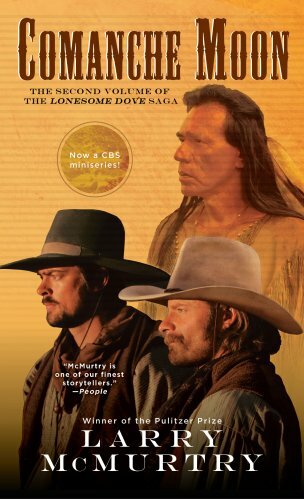 I've really loved all of the novels in Larry McMurtry's Lonesome Dove tetralogy. I read them in publication order, which made Comanche Moon, second in chronological order, number four. This novel took me longer to finish than any of the others, but not because it wasn't as good. It was truly as awesome as the other three. But, for some reason, I couldn't get into the mood to read for most of the last couple of months. 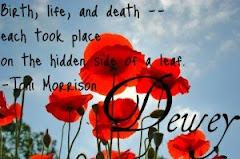 When I DID sit down to read it, the book captured my attention, and, as with the others, I couldn't put it down. Gus McCrae and Woodrow Call are back, with further adventures as Texas Rangers holding down the frontier on the cusp of the Civil War. This book also introduces Captain Inish Scull and his lust-crazed wife, Inez, who were two of my favorite characters. We get to see some of the as yet missing part of Call's life - his relationship with the whore Maggie and the birth of their son, Newt. Making a reappearance in this book are the Indians Kicking Wolf and Buffalo Hump, as well as Buffalo Hump's son, Blue Duck, who later becomes one of the most ruthless outlaws in Texas. The action oscillates between the Native Americans, dealing with the end of their era as free peoples, with the encroachment of the white settlers, the extinction of the buffalo, and the movement of the Indians onto reservations, following the Civil War. It follows Scull, who is captured by the Black Vaquero in Mexico...can he escape? How? It traces Call and McCrae's years as Rangers, each man rising to the rank of captain. Once again, McMurtry's characters carry the story. I've loved the character of Gus McCrae since I first came across him in Lonesome Dove, and he is the same old Gus in this novel. I thoroughly enjoyed getting to visit with him again, although I was dreading the end of the novel, because there were no more. However, there's nothing to prevent me from going back and reading these again whenever I feel like it! I give this installment four out of five Whatevers, since it didn't hold my attention like the others. But it's absolutely worth the read, especially if you've read any of the other books!